The front: On the road, looks like Veterans Stadium in Philadelphia. 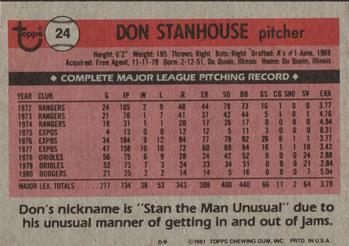 The back: The nickname is a play on Stan “The Man” Musial. Stanhouse was also called “Fullpack” for the amount of cigarettes manager Earl Weaver would go through during his relief appearances. The player: Stanhouse was actually quite effective with the Orioles, but was unable to duplicate his success in Los Angeles. He did not play in the majors in 1981, appeared briefly with the Orioles in 1982 and then retired. Overall, he pitched for ten seasons in the major leagues, winning 38 games and saving 64. His best season was 1979, when he went 7-3 with 21 saves as he made the AL All-Star team and led the Orioles to the pennant. The man: Since his retirement he has been active in the energy industry, and is the Principal Owner of Pro Players Power and Gas, an energy broker which helps businesses and homeowners find the lowest rates possible for their electricity. He shared his thoughts on baseball cards with this blog in 2010. My collection: I have eight of his cards, from 1973 to 1981. 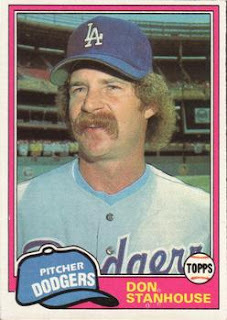 I would be interested in trading for 1977 Topps #274. I'll never say '81 Topps is my favorite, but I love seeing these cards pop up on my feed.